“Live in the Web Center. 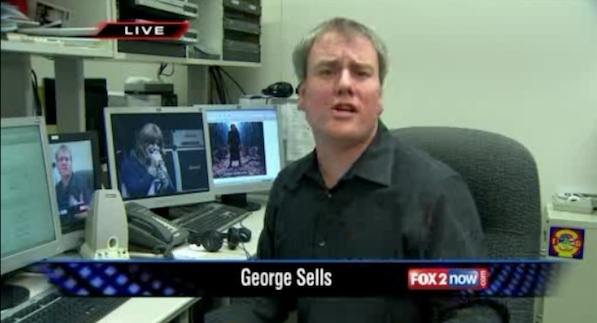 This is George Sells, Fox2 news.” The Web Center?! Fox2 calls a room in their office “The Web Center”. 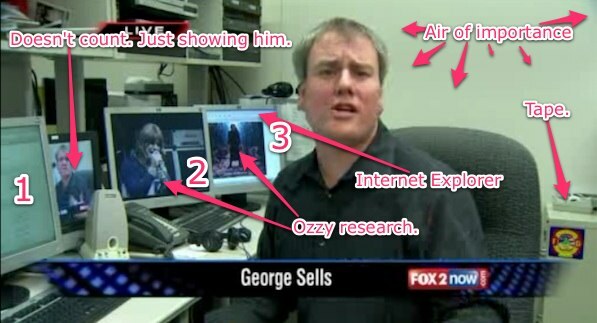 Here’s reporter George Sells in there now doing web stuff on his multiple monitors which we can only assume doubles as a emergency NASA launch center in St. Louis when the need arrises. I know. Its really crazy in the Web Center. Its tough to take all in. Here’s an annotated version of the shot. That’s three monitors showing all kind of Web Centery stuff like Ozzy photos, and lets not forget the tape in the background. Ok this thing is a converted closet isn’t it?! It has to be. Somewhere there is a janitor pissed off he can’t keep his mop there anymore. Why go the trouble of calling this clearly random room with an outlet on one of the walls the “Web Center”…is it because this room has the good power strip? It would be another thing if this was 1987 and this was the only room in the whole building that had the internet, but come on! Every intern in the station has a computer, making every cube in the farm a little “mini Web Center”. Hell we have internet on our phone…are we always in a Web Center where ever we go? You tell us Fox2, you’re the ones that had to get all fancy with the names for closets. Oh wait. Is calling it “The Web Center” how you convinced George to move to the room in the basement with those boxes of Jaco Report tapes?